Welcome, 1964 Grant High School Classmates, to the official 50-year reunion website. Wow, it’s been almost 50 years! We, the Class of ’64 members, spent some important time together. Our senior year was ushered in by the March on Washington and Martin Luther King’s “I Have a Dream Speech.” We won a state football championship and lost a president in the same breath. We welcomed the Beatles and sang, “I Want to Hold Your Hand.” When we began high school, Khrushchev and Sputnik had us shaking in our Sbiccas, but by 1964, Khrushchev had been stared down in the Cuban Missile Crisis, while Alan Shepard, John Glenn, and Gordon Cooper had all orbited the earth in manned spacecrafts. And, we share this 50th anniversary with the Civil Rights Act of 1964. We were the products of change and became the agents of change. While, as a class, we represent enormous diversity, we are forever bound by the events and people that launched us in the early '60s. Let’s not miss this chance to bring our long and winding roads back together. Enjoy the website using the tabs above to gather information of interest to you. 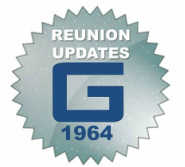 Please click here to find all the latest reunion information. Reserve Your Tickets for the Reunion Party by Clicking Here. Although the July 1st deadline has passed, you still have a few days leeway to complete your questionnaire and send a photo. Or download, print, and mail the form below. © 2014 All Rights Reserved. Grant High School Class of 1964. Portland, Oregon.